Some Moths Escape Bats By Jamming Sonar For over 50 million years, bats and moths have been engaged in an evolutionary arms race. A study in the journal Science identifies another weapon in the moth arsenal: the ability to jam bat sonar. Aaron Corcoran, of Wake Forest University, explains the research. For over 50 million years, bats and moths have been engaged in an evolutionary arms race. A study in the journal Science identifies another weapon in the moth arsenal: the ability to jam bat sonar. Aaron Corcoran, of Wake Forest University, explains the research. This tiger moth, Bertholdia trigona, is the first animal known to defend itself by jamming the sonar of its predator, bats. Graduate student Aaron Corcoran tied two types of tiger moths to fishing lines. Those moths that had an organ that makes ultrasonic sounds removed were easily gobbled by a bat. Those with the organ were able to use it to jam the bat's natural sonar and live to tell the tale. Bats are among nature's cleverest predators, using ultrasonic signals to locate their prey at night. They make pretty quick work of moths, one of their favorite meals. However, one species of tiger moth that lives in the southwestern U.S. apparently has learned to outfox the bats by jamming their signals. 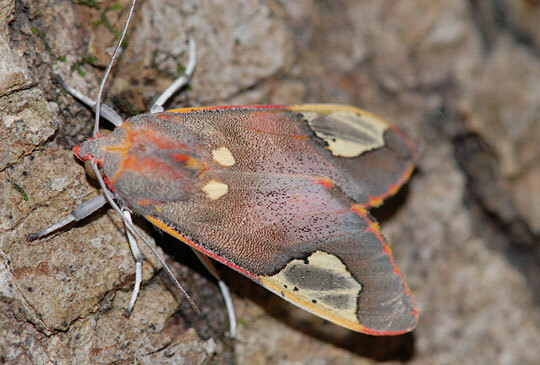 In the bat-eat-moth world of the summer night, moths are at a distinct disadvantage. 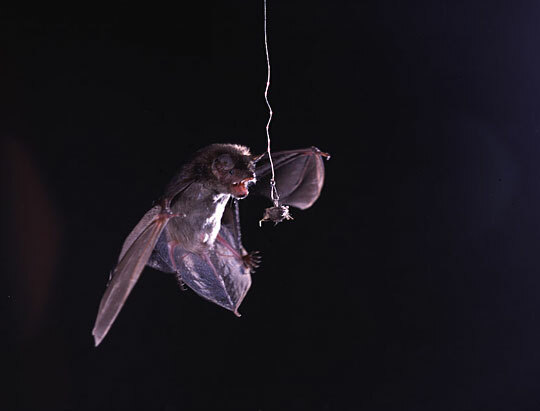 Bats can locate and snap a moth out of midair with the greatest of ease. They use what biologists regard as one of the animal world's most efficient tools of prey: ultrasonic signals that work like sonar. But Aaron Corcoran, a graduate student at Wake Forest University, was intrigued by a species of moth that also makes ultrasonic sounds. He wondered if this was some kind of bat deterrent. 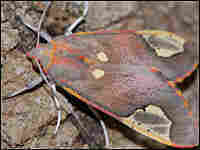 The moth, a 1- to 2-inch-long orange species called Bertholdia trigona, has organs on its body called "tymbals." "A tymbal works like a pop can," Corcaran says. "If you push in on the side of a pop can, it will make a click, and when it releases out it makes another click. We've measured up to 450 clicks in a tenth of a second. That's a tremendous amount of sound that this moth is making." Corcoran removed the tymbals from some of these moths and then tethered the insects with fishing line, so they could fly, but not far. He brought in a bat and filmed what happened. As a bat is flying around, it is constantly making chirps and listening for the echoes, Corcoran says. "And as it closes in on the insect, it increases the repetition rate with which it is making those sounds." The chirps stop when the bat snares the moth. The tethered moths, the ones that could not click, were gobbled up easily by the bats. Corcoran decided to try the experiment using an intact moth with its tymbals clicking away as the bat closes in. "You hear the bat going through its normal progression and starting to speed up," Corcoran says. "Then the moth turns on its sound production, which sounds almost like a siren because the pitch is going up and down. At that point, the bat does something very abnormal: It starts slowing down its repetition rate, the opposite of what it normally would be doing. As soon as the moth's rattle-like sound started, the bat got confused and missed the moth. This kept happening, over and over, until the bat gave up and crawled back to its cage." Corcoran, who published his findings in the journal Science, ran the experiment several times with the same results. He has ruled out the idea that the sound just startles bats, as the bats would have grown used to that and eventually would have had more success. Corcoran and his colleagues think the moths are using some kind of ultrasonic jamming. "What appears most likely is that the clicks are interfering with the bats' neural processing of the echoes that are coming back," Corcoran says. 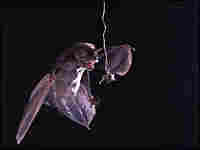 If you live in the southwestern U.S., you just might catch some of this aerial action underneath a streetlight at night.